Welcome to 2019! The past year has been a whirlwind. I’ve travelled around the country, speaking at conferences and getting to know the other leaders in the marketing space, along with many of our customers that are using Animoto to grow their businesses. What have I learned? There’s a ton of noise in the space around new and emerging technologies like 360 video and virtual reality, and that’s exciting. But what’s been most exciting for me has been the chatter around all of the things that are working and just beginning to take off. For small businesses, the opportunity to hop on these proven trends in 2019 is massive. I’ve cut through the noise and rounded up the seven trends I’m most excited about for video marketing in 2019, both for our customers and for Animoto’s own marketing initiatives. This is one of the things I’m most excited about. 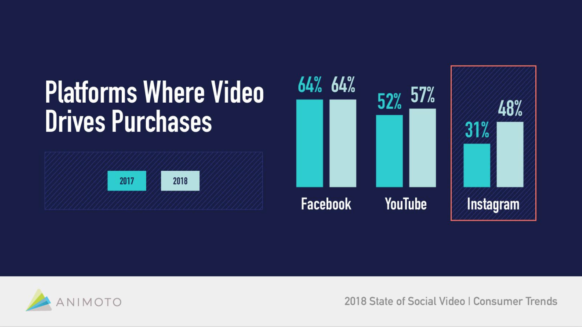 Social video affords small businesses a massive opportunity to level the playing field when it comes to their marketing. Not long ago, it was the big brands with the big budgets that were gaining the most attention, with expensive commercials and ad campaigns. 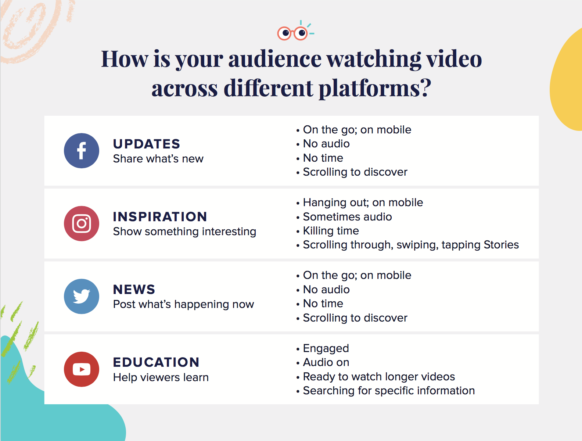 But today, your business videos can live right alongside the videos of Fortune 500 brands in the news feed, or intermingle with them as your followers tap through their Instagram Stories. You can target the same audiences with your social ad campaigns—or even the audiences of big brands you admire! A big part of what will make is possible for small businesses to compete for attention is the fact that brands, more than ever, are embracing authenticity over the polished look of large-scale productions. Why? Over the past year, it’s become more difficult for brands to earn consumers’ trust online. As a result, they’ve had to become more genuine and connect with people on a more personal level. To achieve this, they’re sharing content that feels more authentic and real. They’re shooting on phones, embracing their imperfections as a means of connecting with their customers. In other words, their content is starting to feel more every-day and less produced—the type of content small business owners can easily create on their own. 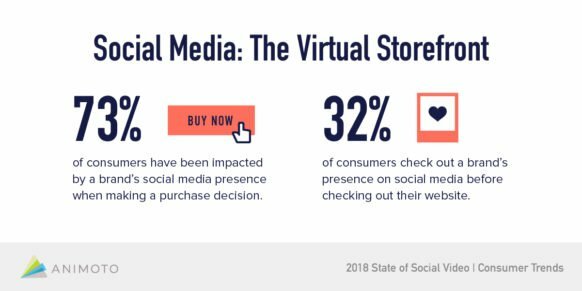 According to our recent consumer survey, 32% of consumers checked out a brand’s presence on social media before their website in 2018. That’s nearly a third of consumers heading straight to social to find out more information about your business. What are they finding there? I’ve find that I’ve become more likely to assume that a business’s homepage is out of date. I go to social media to check to see what’s happening now. Is a brand having a sale? Have they released any new products? Have they published any content worth checking out? Your social media presence is more important than ever. In 2019, it’s going to be important to make sure that your platforms of choice—Facebook, Instagram, YouTube, Twitter, LinkedIn, or wherever your customers are—are up to date. And video is the most engaging way to share. Gone are the days of plastering one video across all social platforms. Over the past year, I’ve witnessed more business owners become aware of the fact that one video does not fit all. In fact, our survey showed that 73% of marketers have begun creating different videos for different platforms. Consumers are going to different social platforms for different reasons, and the behavior is different on each. If you’re not yet, start planning your video content accordingly in 2019. 2018 was a big year for Instagram, with more and more businesses embracing the mobile social platform. But that was just the beginning. 2019 is Instagram’s time to shine, and video is going to be a big part of it. In our 2018 survey, 48% of consumers said they’ve made a purchase due to a brand’s video on Instagram. And this is a whopping 32% increase from 2017. Video is resonating with consumers on Instagram to the point that they’re purchasing. Why is there such a big opportunity for businesses on Instagram? Unlike other social platforms, where visitors typically interact with the friends, families, and businesses they follow, Instagram offers a big opportunity for getting discovered. On a Q3 2018 earnings call, it was revealed that about 20% of the time people spend on Instagram, they’re in the Explore tab. Through the right hashtag usage, you can get on these “explorers” radar and capture their attention with a video in motion. And when you’re not capturing attention through videos posted in the feed, you can be engaging with customers and potential customers in Instagram Stories. Each year reveals that consumers are watching more video than they did the last, and 2019 will be no different. Consumers say video is the #1 type of content they like to see from brands and, as more brands and businesses realize this, they’ll be incorporating even more video into their marketing throughout all stages of the customer journey. Video can be used up front to drive awareness, with interesting, educational, inspiring, and entertaining content, made to capture attention and share. But video isn’t just an awareness play. It can be used to showcase your expertise and answer common questions for customers still deciding whether to do business with you, or close the deal with a video ad featuring a direct call to action to purchase. Last but not least, let’s talk about B2Bs—businesses selling to other businesses. Until now, video has been largely used by brands and businesses that are selling to consumers. However, LinkedIn native video is changing the game. According to LinkedIn, video content is shared 20X more than other content formats in the LinkedIn feed. And that’s not all. LinkedIn video ads are generating view rates close to 50%. There’s a huge opportunity for B2B businesses to reach new potential clients with videos like the following. Not a B2B? There are still opportunities to share your thought leadership and recruit with video on LinkedIn. Here are some ideas. I’d love to hear what you’re most excited about when it comes to video marketing in 2019. Leave a comment below, join our Social Video Marketing Community on Facebook, or come meet me in person if you’ll be at any of the events I’m attending this year. You can find me at Photo Booth Expo, Wedding & Portrait Photography Conference & Expo, Social Media Week NY, and Digital Summit Conferences. Whether it’s in person, or online, I hope we can connect this year!